Juul De Bruijn has taken advantage of each square centimetre of her room. How? By burying every function under walking level. Juul, how did you get the idea of MoreFloor? I designed the MoreFloor to solve my own problem I have with living in a small apartment in Eindhoven. I really needed an extra room to work and got frustrated that I only used the bedroom for the minority of the time. Therefore using the square meters that my bed and closet take, would give me the extra room I needed. Could you tell us a bit more about yourself? what’s your story? I graduated at the Design Academy Eindhoven at the department “Man and Mobility” in January 2018. When I was a child, I loved to work with my hands, which I still do. My parents have always supported me in this, there was always enough material to work with. I loved to play by myself in the garden or the attic. I created different fantasy worlds and I could entertain myself for hours like that. When I became older I still liked to play. I played with my classmates. The whole story we played, was based on our fantasy. It was amazing to just go with that feeling, not thinking about yesterday or about tomorrow. If I think back about this time I remember the wonderful feeling of losing yourself in fantasy. Unfortunately a lot of people lose it, when they grow up. In my work I show my own fantasy and combine it with my taste for crafts and DIY. Congratulations Juul for this lesson of “anything is possible” design. 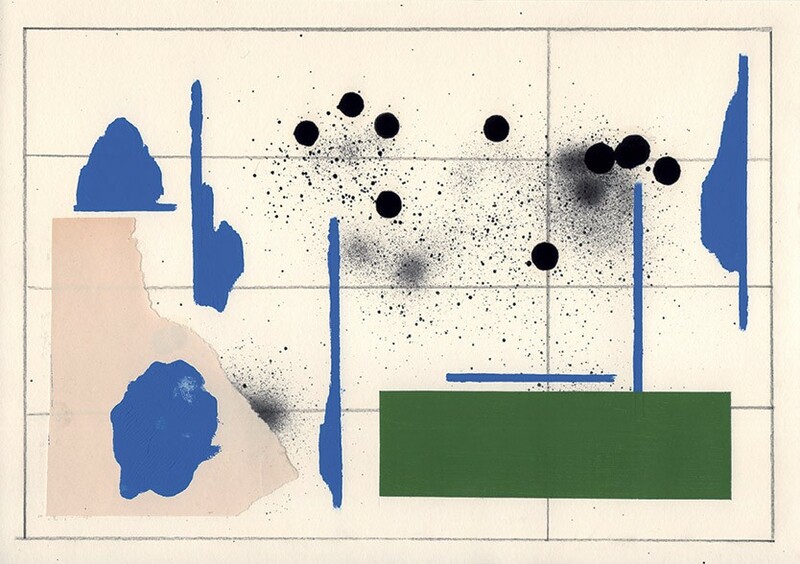 Interesting piece by Emma Wessel : the Palettes. It can be a sitting, a space divider or a carpet. All our apologies for the very very long period without any post. Just to make you a little more angry at me, I will just say that I was resting in Tuscany, but this may be the subject of a future post, so I will not say anything more. For now, we are very happy to introduce Shade Volume, a new collection of lamps, which is the result of a collaboration between French designer Marc Trotereau and Dutch designer Merel Karhof. They really used Merel’s sense of color and Marc’s experience with shade and lighting design. It is worth seeing their previous work to understand what I mean. 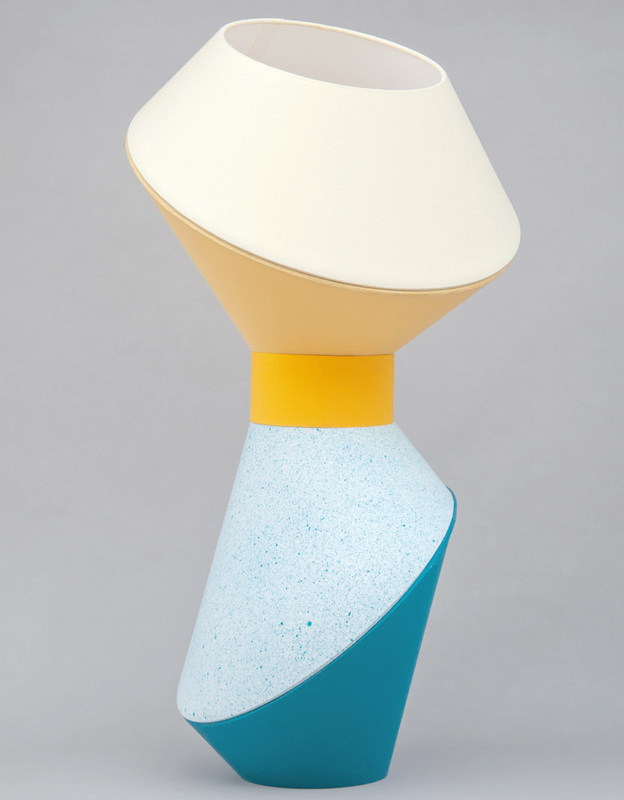 The main idea of these lamps is to create a useful and weightless lighting system by joining two or more lampshades. The design approach is to create a-symmetrical shapes that require no more labor or material than a classic drum or conical shade. The main twist consists in the development of a clipping system that allows the transformation of each lampshade into an interchangeable part. 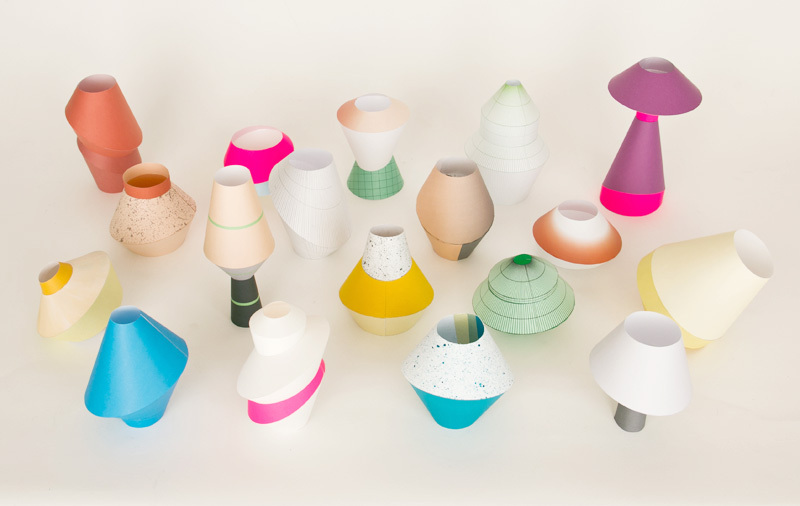 This simple system gives the possibility to quickly assemble lampshades together and create endless variations of enlighten shapes from small floor or pendant lights to large totems reaching the ceiling. The process could be likened to Isamu Noguchi’s take on the Japanese traditional rice paper Gifu lantern to create ‘Akari’. Akari means, illumination but is also implying the idea of weightlessness. One of Noguchi’s famous quotes puts his source of illumination at the heart of the home: ‘All you require to start a home are a room, a tatami and Akari’. The very neo-vintage Montreal based light production company, Lambert & Fils, has just released prior to Krotrijk Design Biennale, an incredibly attractive light. At Hlow, we are simply blown away, well in fact we did not know that there was a way to reconcile all our apparently contradictory influences: modernism with post-modernism, color with contrast and fantasy with minimalism. This new series of celling lights, Laurent, is brilliantly precise, elegant, geometrical and light. The way it plays with the shadow owes to Gino Sarfatti’s work among others. Many thanks Lambert &Fils. Now we know what we like: YOU! This is one our dream splurge at HLOW. The most confortable hammock on earth, to enjoy weightlessness even in the winter. It is a piece from 2007, by Bless, one of the most creative Berlin clothes and furniture designer. It is called N°28 Fatknit Hammock and was part of a mixed medium collection and show called Climate Confusion Assistance. It is buyable online here for 3500 euros. And it is starting to be considered as a masterpiece in design history as it has been purchased by the tremendously cool MADD (Museum of the Decorative Arts) of Bordeaux (France), managed by the fabulous Constance Rubini. L’Endroit Edition is a French organisation that sells real art prints for terribly affordable price. It is not meant to make money but simply to afford itself, it is a long-distance project meant to be looked at with the distance of History, as giant curatorial project. L’Endroit is managed by an Artist, Mathieu Renard, who is sufficiently devoted to his cause that he attracts other serious creators and curators such as Claude Closky, the 2009 France representative at the Venice Biennale, Claude Lévêque and Hans Ulrich Obrist to work with him. L’Endroit does not choose its collaborators on their fame, some are young or lesser known artists. But it’s a generous way to enable them spray their work. And it is a success: there is now a gallery attached to the project in the Ouest of France, in Brittany. We at HLOW wanted to talk today about one piece that we particularly adore: Fantasy 1 by Fabio Viscogliosi, wich costs 30 euros, is edited at 20 exemplars and is signed and numbered. George Sowden was one of the founding members of Memphis Milano, together with, among others, Ettore Sottsass, Michele de Lucchi, Martine Bedin, Andrea Branzi and, of course, his wife, Nathalie du Pasquier, the great Memphis pattern designer. The name of this design mouvement, Memphis, came from the Stuck Inside the Mobile with The Memphis Blues Again song, by Bob Dylan. The idea was to juxtapose in this name two paradoxical symboles: ancient Egypte and American pop culture. Their idea was to recreate an affective link between the man and the object (filled with historical references, humour and colors). The mouvement was actively supported by several firms, fist of which was Artemide and its director, who was also a designer, Ernesto Gismondi. The Wikipedia page about Memphis is very interesting. We at HLOW highly recommend it. George Sowden was the British designer of the group, he had started working with Sottsass for Olivetti in the 70s. Nathalie Du Pasquier and him are still living and working in Milano today. But at HLOW, we are more interested in the pieces of furniture he has produced in the early 80s than in the very long list of collaboration Sowden has had for the industry since then. The first is a piece Sowden has designed for Nestor Perkal (the French/Argentinian designer/gallerist who was one of the first to support Memphis in his Parisian gallery). It is very light and looks like a book that you would have opened in a cartoon. 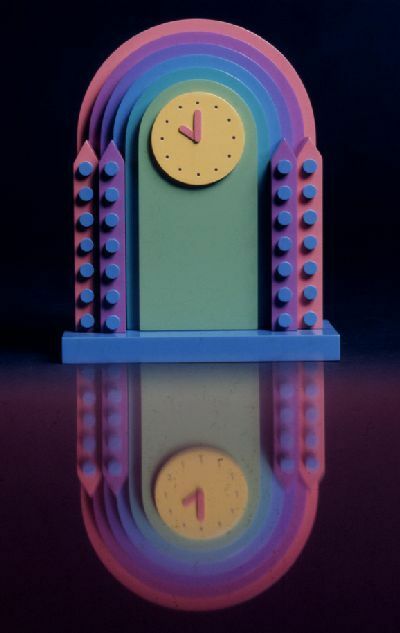 And the second is a clock Sowden has produced even earlier, in 1973. This is a research project he has done out of wood. Sorry for the bad quality but this image is very hard to find actually, so consider it as a little treasure from the past.